Leifsdottir, a luxury brand for Anthropologie, is one of five retail brands owned by Urban Outfitters. The clothing has been described as ‘hip’ and ‘kitschy’ and focuses on luxurious appeal to the bohemian or hipster shopper. Leifsdottir’s spring collection included a mix of shorts, maxi dresses, sheer tops, feathered trims, anaconda prints, mini – skirts and panther swirls. 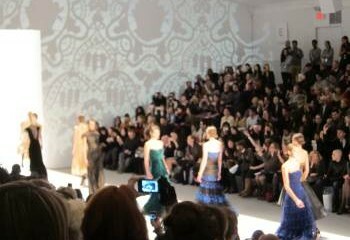 The models wore dark sunglasses and walked to music by DJ Wilson who created a set to accompany the presentation’s esoteric appeal. The presentation also included a video backdrop of the rainforest and several terrariums growing moss, fiddle heads and burlap displayed throughout the room. 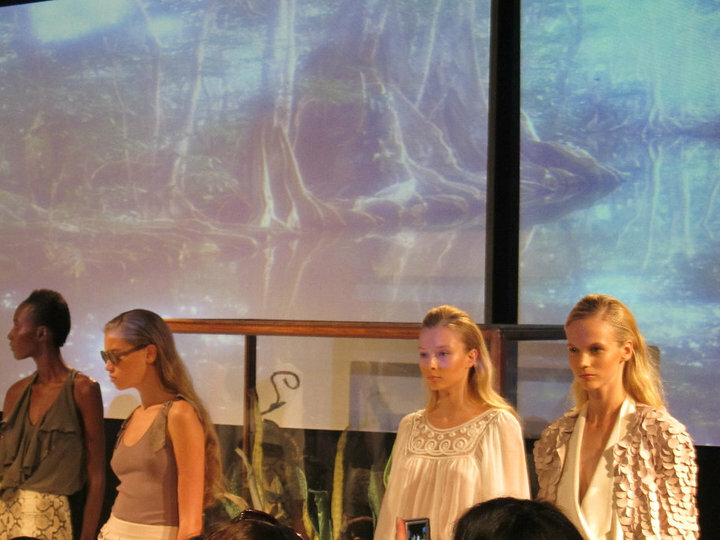 Finnish designer Johanna Uurasjarvi, who made a brief appearance towards the end of the show, said her inspiration was a trip she had made to the Amazon. Leifsdottir also launched it’s first shoe collection at the show with snakeskin platforms and feathered detailing.